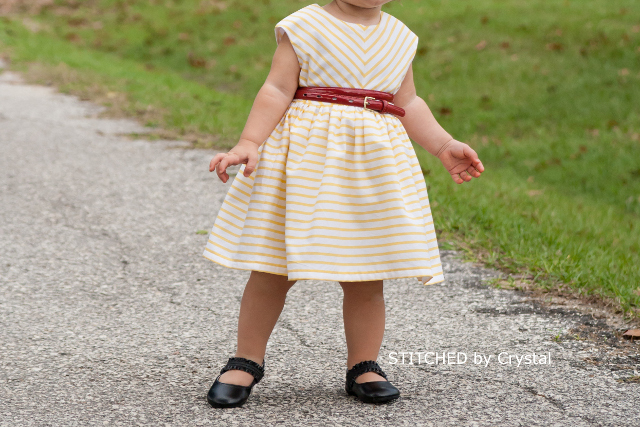 Last week I had the opportunity to test Mouse House Creations newest pattern, the Caroline Party Dress. You may be thinking "that doesn't look much like a party dress". That is because I chose a simple cotton fabric and went with the most basic pattern options. This dress has cap sleeves that are built into the bodice and a really full skirt. 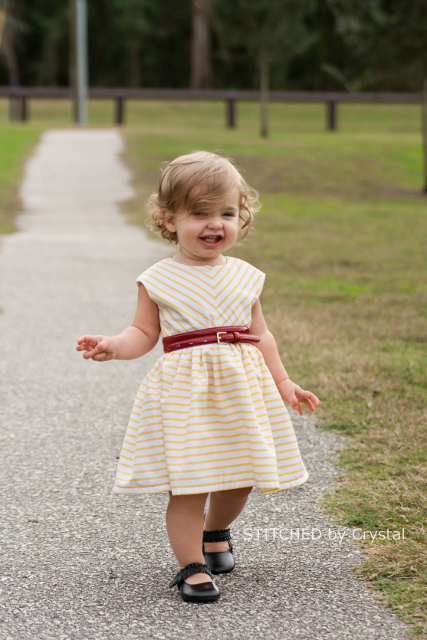 It has options for a peter pan collar, belt loops, a tulle underskirt, and even for pockets! I was really amazed at how versatile the pattern could be. 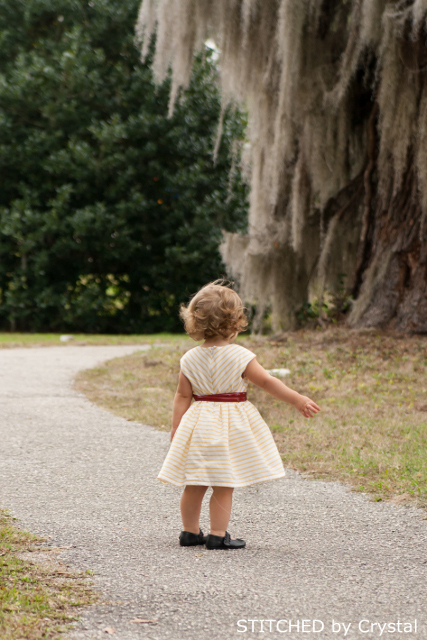 It can be super fancy if you pick a fancy fabric and add the tulle or it can an everyday dress. Some of the testers even made it in knit! The dress closes in the back with an invisible zipper and Hayley walks you right through the zipper installation if you have never done it before. 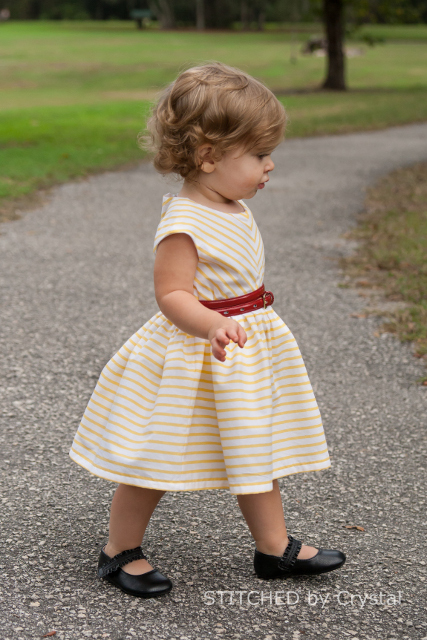 I love a zipper closure, it makes dressing a toddler SO much easier! 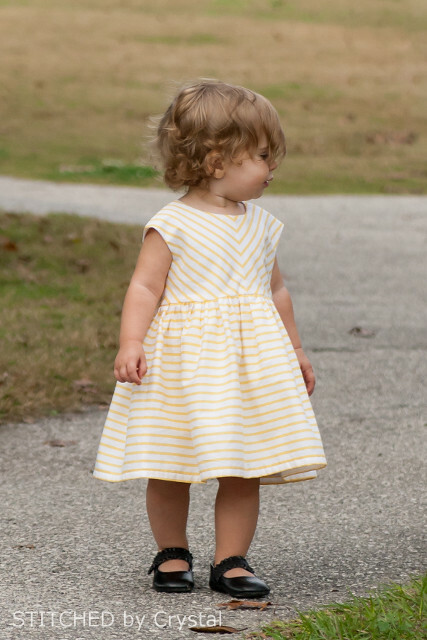 This dress is made with some yellow stripe from Michael Millers Out to Sea line that I have been hanging on to for a few months. I had really wanted a navy or black stripe, I think that would be so striking. I only had the yellow so I went with that and oh man, I love how it turned out! I cut the bodice on the bias so the stripes form a V on the front and back, I think it looks awesome on the cap sleeves. I am hoping she doesn't have any crazy growth spurts between now and spring so she can wear this as an Easter dress. Now I am way ahead of the game with the Easter dress done in December! 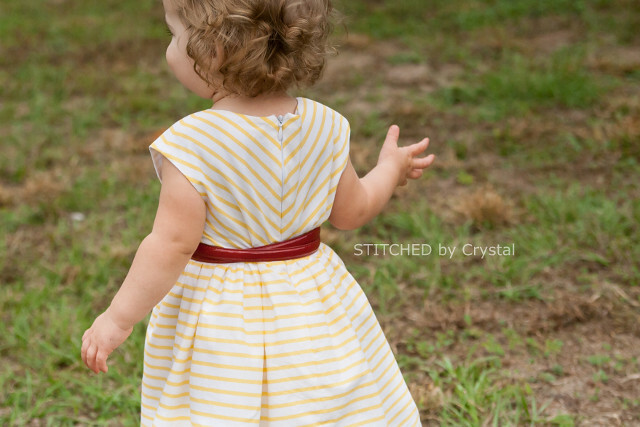 The pattern is releasing today to make sure you stop by her shop and check it out!